Un joliment aménagées 5 chambres et 5 salles de bain maison avec une piscine privée et un spa. Vous êtes à quelques minutes de la porte des parcs Disney. La propriété est en souhaitable Windsor Hills, vous donnant accès à un terrain de golf, le théâtre, les enfants aire de jeux, courts de tennis, terrains de basket et même un terrain de beach-volley. service sur le club-house de concierge et vous pouvez même organiser un service de navette pour les parcs Disney. Cuire dans la cuisine entièrement équipée ou profiter des divers restaurants à seulement un jet de pierre. WiFi gratuit et téléphone gratuit à la maison. Si vous visitez avec des enfants, demandez si vous avez besoin d'un jeu de société ou d'une chaise haute. Nous sommes également très flexibles sur Pool Heat, avec de longs séjours de plus de 10 jours pour obtenir la piscine souvent sans chaleur. 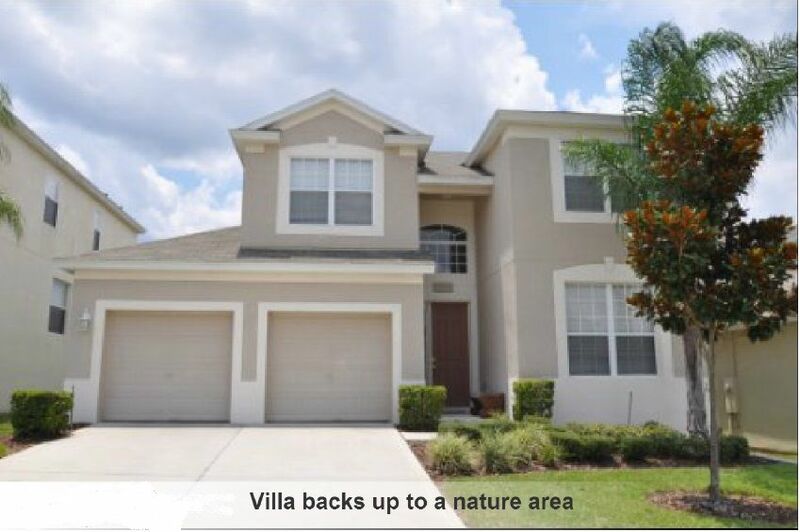 Réservez cette maison pour rendre vos vacances à Orlando inoubliables et relaxantes. Immortalisez vos souvenirs de vos vacances à Orlando durable dans cette maison loin de la maison. Pretty nice home. Lots of space! Overall this home was nice. Any issues we had were resolved quickly and the owner and property manager were very responsive. The location is great and the price is fair. We would stay here again. Thank you for your stay at our home and look forward to you next stay. I will try to keep this as condensed as possible while giving an honest assessment of our stay. while it was only my wife and I, we were expecting a well appointed high end rental in the wonderful Windsor Hills area. This home has the potential of being a 5 star place however, a lot of work and repairs are required and greater attention to details. Arrived to find tiled floor in desperate need of a good scrubbing, you can see the dirt along the high traffic areas throughout the ground floor. Kitchen was clean however cupboards peeling in several areas dishes were sparse at best contains mostly plastic plates. TV was small and the remote requires the strength of Hulk Hogan to operate. Pool area is in desperate need of a good cleaning, removal of grass between stones, the lounge chair padding was so bad, we could feel the supports below. Pool heat, was barley existent. Pool has a very obvious leak resulting is water being added at an unnecessary rate. Phone... did not work... was told to use wifi calling - really?? The property manager Dee, tried her best to accommodate however, it is my guess she is not getting the cooperation of the owner nor financial approval to make the required repairs or changes. Ryan and Priya, it is time to spend some money at this house to give your renters the quality and comfort they are paying for. Your required investment is minimal now to bring this place back to life.. pay a little now or a lot later!! Gord...appreciate your feedback. Our manager Dee and us have a upgrade plan in progress for sure. We visited and viewed the property ourselves. We have noted your points and will work on the necessary items. Thanks for the note and we shall look forward to a better stay next time around. The stay was overall amazing! The resources such as the wii and the DVD’s were very entertaining it kept our family busy and entertained! The pool was great! And the neighborhood was amazing! The community pool and that area close to the entrance was great! In general everything was great! And I would definitely stay again! So close to the parks, the house is located in a perfect place so close to the markets an parks. The house is so comfortable and everything inside was cleaned. The owner provided on time response to any our requirements. Cleaning fee of $105 on stays of 5 nights or less. Pool/Spa heat is $25 per night or $150 per week—Recommended October through March. 5 night min on most stays, 7 night min on stays during high and holidays. Exception: when certain dates become available between stays. 13% taxes apply to all rentals Baby items include high chair, and a pack'n play and a pool barrier Gas grill available for rent...directly from Rental and is not part of rental amount.